and high speed internet services. 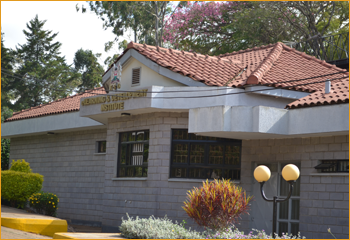 The Kenya School of Government (KSG) was established under the KSG Act No. 9 of 2012 (which came into effect on 1st July 2012), as a successor to the former Kenya Institute of Administration (KIA) and the Kenya Development Learning Centre (KDLC) and incorporates the four former Government Training Institutes (GTI’s), Mombasa, Matuga, Embu and Baringo. The KSG was established to provide learning and development programmes to build public sector core competencies and inculcate public service values and ethics within the framework of a devolved system of government for a results-oriented public service. The KSG – eLearning & Development Institute (eLDi) is one of the six campuses established under the School. The mandate of eLDi is to leverage Information and Communication Technology (ICT) in providing quality and innovative capacity development programmes in furtherance of the KSG mandate. eLDi is equipped with a state-of-the art information communication technology infrastructure in Nairobi with an operational hub at the KSG Mombasa Campus. The Institute provides a conducive learning environment suitable for its local, regional and international clientele. We organize and implement training programs, conferences, workshops and seminars using video conferencing and web based resources. We provide video conferencing and high speed internet facilities for hire. We provide linkages with over 120 similar GDLN centers in 80 countries around the world for meetings and training events. We identify content providers to suit individual institutional requirements. Search, identify and offer relevant (as determined by your organization), flexible content from around the world. Harness expertise in a wide variety of disciplines and connect with knowledge centers around the globe. Enable target beneficiaries to learn in their home environments without costly travel and work disruptions. Promote dissemination of knowledge/best practices, advances in policy, culture and technology among a wide range of actors for enhancement of the development agenda. We offer training in Fundamentals of e-Learning and e-Learning course Production as courses run using interactive workshop methodology within our state-of-the art multimedia laboratory. Using proven instructional design principles we develop e-Learning courses ranging from beginners’, intermediate to advanced level courses. e-Learning research at eLDi is carefully conducted using internationally acceptable methodologies. The results of the research are used to improve e-Learning services at the institute. We carry out e-Learning related consultancy for Government and private sector institutions in such areas as the installation and customization of Learning Management Systems (LMS), design, development and uploading of online courses for clients who require these services. The lessons learnt from the consultancies are employed as feedback to further improve our consultancy offering and communicated as advice to Government and private sector institutions. To augment our e-Learning we facilitate in-country and inter-country dialogues via our video conference facility. These dialogues are beneficial for knowledge exchange between and within global public and private institutions in a wide range of topical issues. Copyright © 2019 Kenya School of Government-eLearning & Development Insitute. All Rights Reserved.